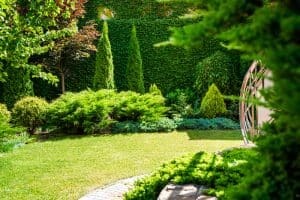 In 2018, there’s plenty of fantastic growing trends for landscaping your garden. The best thing of all, you can combine DIY with some professional work to have your outdoor space a place where you can wine, dine or simply play with the kids! Check our best landscaping tips for the year. When you are landscaping, it might be tempting to fill your garden with high garden beds and artificial turf. While garden beds are great and easy to maintain, artificial turf looks just that ‘artificial’, and during heavy rains, you can often end up with a swimming pool in your backyard that you didn’t want. Opt for a natural setting with real turf, and a mixture of garden beds and pots to create layers of interest in your garden. Before you start landscaping your outdoor area, you need to look over your property plan. If you are planning to build any structures on an easement or along a fence line, you may need to gain permission from the local council first. Don’t underinvest in something as important as turf. Seed can be hit and miss, and takes a long time to establish. If you want your landscaping to immediately look fabulous and withstand the weather all year round, then you’ll want turf that is of high quality. If you’re placing turf nearby young trees, consider the shade they will provide in future years and choose turf that will be suitable in both shade and sun. DIY is fantastic, but don’t be afraid to outsource. Preparing the ground for laying turf can be one of the biggest jobs in landscaping, so you might consider having it done by a professional. This way landscaping won’t turn into an unfinished project, and is done sooner rather than later so you can enjoy your fantastic new outdoor space. Australia isn’t getting any cooler during summertime, and Sydney is no exception. Landscaping in the cooler months is kinder on your turf and your new plants, but it’s also easier on you, as you’re able to get a lot more done without sweating it out in the harsh heat. It’s a rising trend to be able to cook, clean and entertain in your backyard. Cooking outside is going far beyond the classic Aussie BBQ in 2018, with many options for installing pizza ovens, smokers and rotisserie spits in the great outdoors. Don’t forget a central fire pit to sit around on those chilly evenings, and enjoy some of the finer things in life. Since 1974, Hi Quality Turf has offered a wide range of popular residential and commercial turf varieties to homes and businesses such as Buffalo Grass, Couch Lawn, Empire Zoysia, Kings Pride Buffalo, Palmetto, Sapphire Turf and Kikuyu. We can integrate your landscaping ideas with the right lawn type for you. We deliver turf supplies within Sydney, Wollongong, Newcastle and the Central Coast. Contact us today on (02) 45 723 666 for more information.